Protests Slam Fake Iraq Elections | Fight Back! 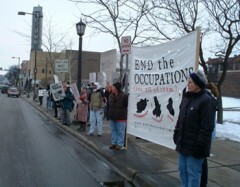 Minneapolis, MN - About 100 people demonstrated here Jan. 29 to oppose the occupation and fake elections in Iraq. Similar protests took place around the country. "On Sunday, the U.S. is staging elections in Iraq. Many Iraqis will boycott these elections, in protest of the U.S. occupation. We’ll stand in solidarity with them, because justice for Iraq starts with an end to the war and occupation. It’s important for us to say that the main issue, the U.S. occupation, is not being discussed enough. In order for any election to have meaning, the U.S. needs to not be there orchestrating the process and tampering with the result," explained Anti-War Committee member Meredith Aby. 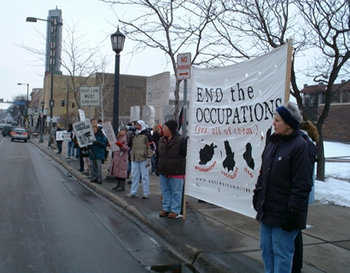 Organizations around the Twin Cities signed on to the protest, including the Anti-War Committee, Anti-War Organizing League, the Counter-Propaganda Coalition, Freedom Road Socialist Organization, the Twin Cities Peace Campaign, Students for Justice in Palestine, the Iraq Peace Action Coalition, the Welfare Rights Committee and the MN Cuba Committee.